Not impressed by the trailer too much read somewhere they only have 2 eps done.. I know it won't be as epic as the first season Madhouse put there blood sweat and tears into that.. I'm in wait and see mode on this. Not optimistic. I legit wish I hadn't watched that PV. Ai well, trying to stay optimistic. Well, that trailer pretty much killed all my interest in season 2. But at least I will still have season 1, as that was good enough to warrant buying on blu-ray, so I can re-watch instead. The art in the video looks different doesn't look good. 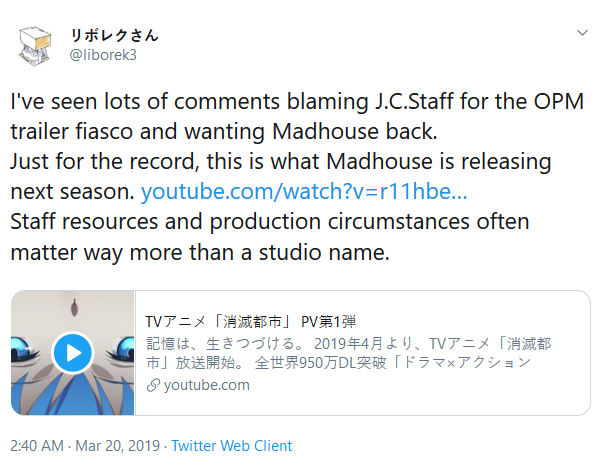 Madhouse did an excellent work with the first season, it was their passion, a labor of love for the title. OPM is a 1 trick pony, as is most satirical comedies. It was fun watching a shounen make fun of other shounen and then showing them all how its done. Look, you don't need the main character to be in mortal danger to make awesome, impactful, and entertaining fight scenes. Heroism only exists when there is the possibility of harm, your main characters are protected by plot armour so heroism naturally cannot exists. Where do I watch it today? I've only seen where it's available for 'Murica but not Europe.